My friend Mandy who blogs over at The Complete Cook Book has posted this list of questions in order for us to get to know each other some more. You too can take part, but please let her know. 1. What 5 items are always in your fridge? 2. What 5 items are always in your pantry ? 3. Do you write a grocery list or do you shop off the cuff? I make a list, divided into the shops I buy the produce from and I very seldom buy something not on the list. 4. What is the most used item/s in your kitchen? 5. What do you have in your kitchen that may seem strange to other people? 6. 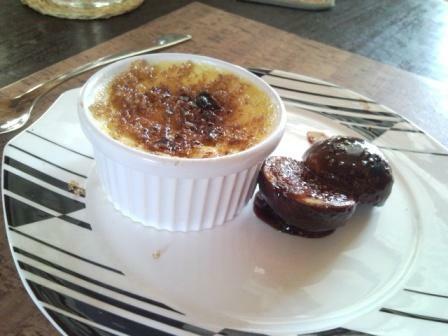 If you were to enter a Come Dine With Me challenge, what would you cook? 7. If you could invite any 4 living people in the world to dinner, who would they be? 8. What is your favourite breakfast out? 9. What one condiment could you not be without? 10. 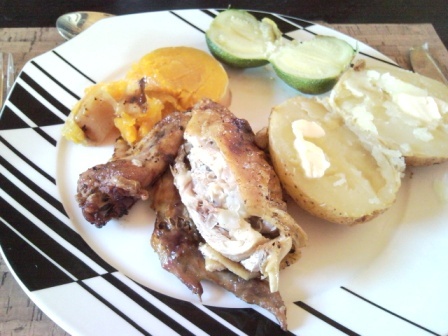 Some people seemed to have a problem eating leftovers or reheated food, do you? 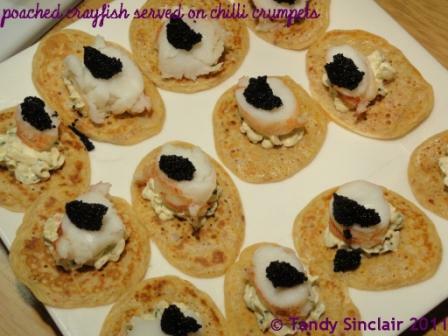 Crayfish crumpets and champers? What a win! Your crayfish crumpets look amazing!! It is a vital ingredient in my happy life 🙂 Thanks for the visit! I know I would enjoy the starter, with a glass of champagne, and I could stay on that all night!! Repeating process of course!